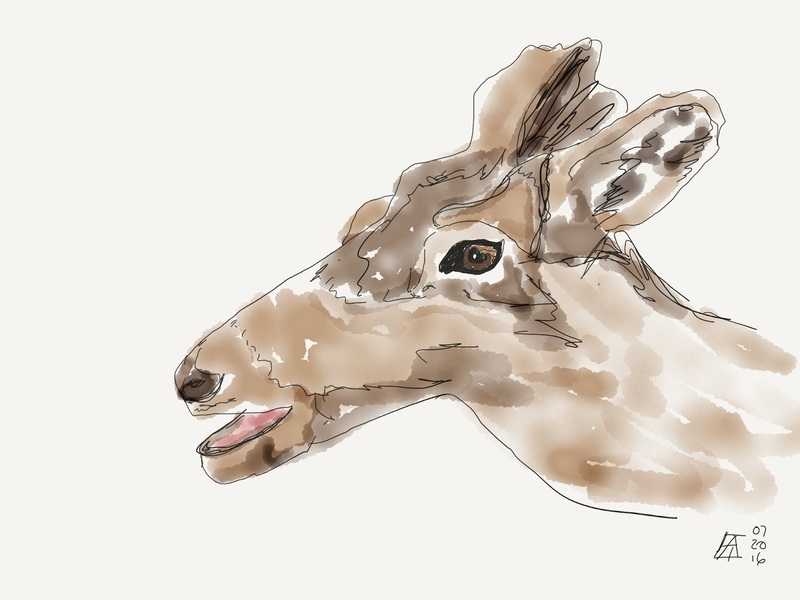 One day, when I returned to my favorite sketching place--The Call of the Wild in Gaylord, Michigan--I decided that instead of taking pen and paints and paper, I would take my iPad. 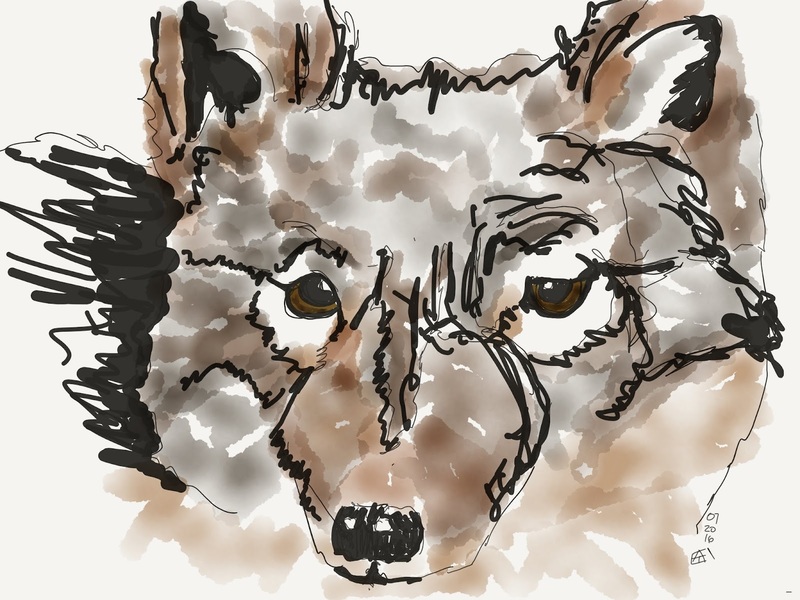 I have an iPad pro, with the Apple Pencil, and I do LOVE it for creating art, even though I don't spend nearly as much time with it, learning it, as I wish I could. The iPad is my go to for drawing sketchnotes of events or meetings or videos or articles, but I don't use it so much for practicing sketching. So I decided to give it a try today. 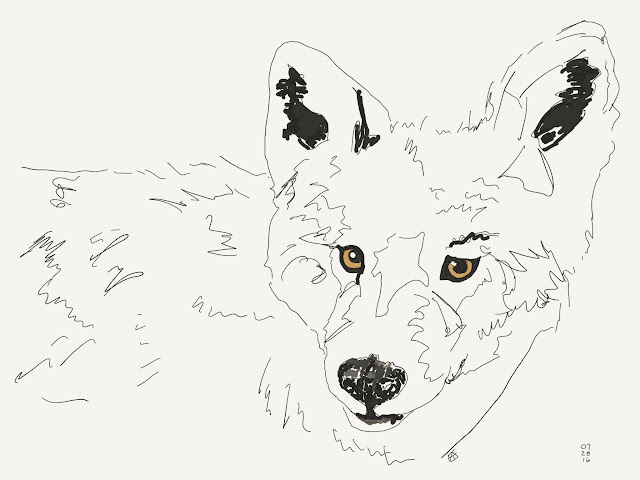 First, I revisited some of the animals I have drawn recently. I tried mimicking the effects (and process) of using pen and of using watercolor. I felt warmed up, but really aware of how unfamiliar with the iPad drawing tools I am. 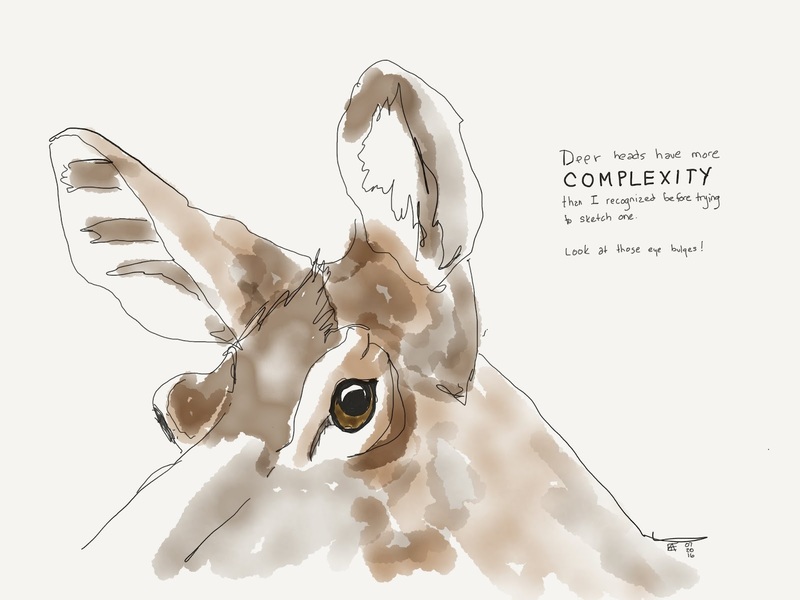 So, I decided to do the rest of my drawings with familiar animals--white-tailed deer. I see these animals frequently near where I live. Well, I don't know what I was thinking. I may see deer all the time, but I never draw them. So, heck, I might as well have been drawing something I'd never seen before. Because as I often note, I see a lot of things in my world, but don't really pay attention to them until I draw them. 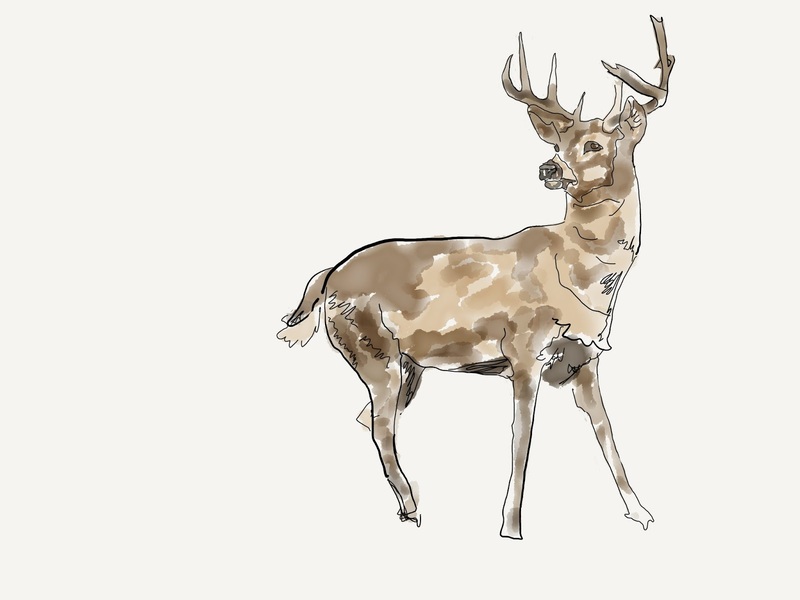 I learned quickly that deer are kind of hard to draw! It hit me only after finishing these drawings that on the iPad, I can instantly make duplicates of my drawings (yes, sometimes, I am slow). So I made a duplicate of the buck and used some of that white space to journal. In call of the wild there are a few animatronic exhibits chronicling the story of one particular early settler. His speech plays over and over on a loop, and I hear it dozens of times while I draw. Today, this one struck me anew, and I copied it onto the drawing. So I have to say I really liked the experience of sketching with the iPad. I liked the portability, not having to deal with water or sharpeners. 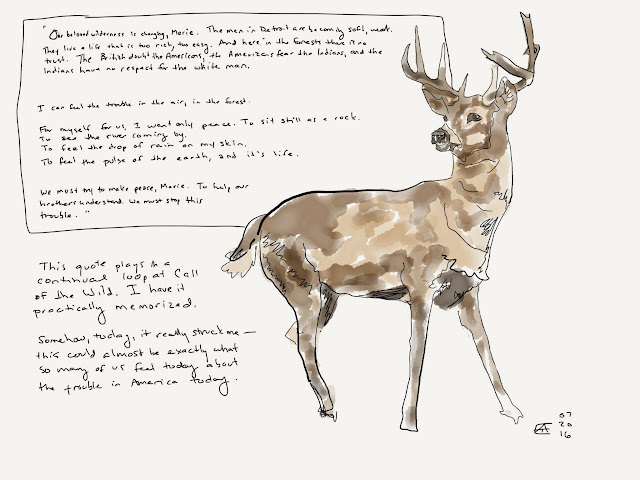 I liked being able to duplicate and journal on a drawing without "ruining" the drawing. What I didn't like was the weight of the iPad on my arm. It outweighs my small journals and after an hour my wrist was quite sore. And, of course, it wouldn't work in many sketching situations, like in bright sun or in any sort of wet weather, or in the dark like at a concert. Glad I tried it though. And I'll try it again.